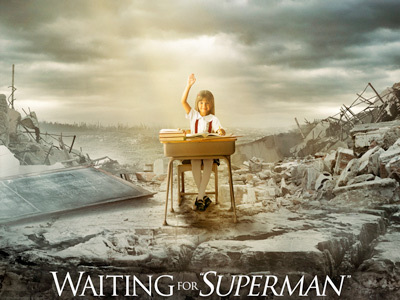 Some agree and some vehemently disagree with the film, but everybody seems to be talking about Davis Guggenheim’s “Waiting for Superman.” Now, a few dozen OnMilwaukee.com readers can see a preview screening of the film and decide for themselves. We have 30 passes — each allows admission on a first-come, first-serve basis for two people (seating is limited) — to see a preview screening of this documentary about public education in America on Tuesday, Oct. 12 at 7 p.m. at Landmark’s Oriental Theatre. A few hundred people have already seen this controversial film — from the director of “An Inconvenient Truth” and “It Might Get Loud,” among others — in Milwaukee when it screened Sept. 26 at the Milwaukee Film Festival. The Oriental Theatre screening was sold out and was followed by a similarly packed forum on education at UWM’s Kenilworth Building across the street. I, for one, am still digesting what I heard in the film and the seemingly endless commentaries, reviews and counter-arguments about it. Certainly, I’m glad that public education is at the forefront of the American agenda right now. Whether or not you’ll agree with Guggenheim’s take on it is, of course, entirely up to you to decide. However, before you draw any conclusions, I encourage you to read education expert Diane Ravitch’s latest book. If you want to see the film and find out, send an e-mail with your mailing address to contests@staff.onmilwaukee.com. The first 30 responders will get a pass. The film opens in Milwaukee on Friday, Oct. 15.